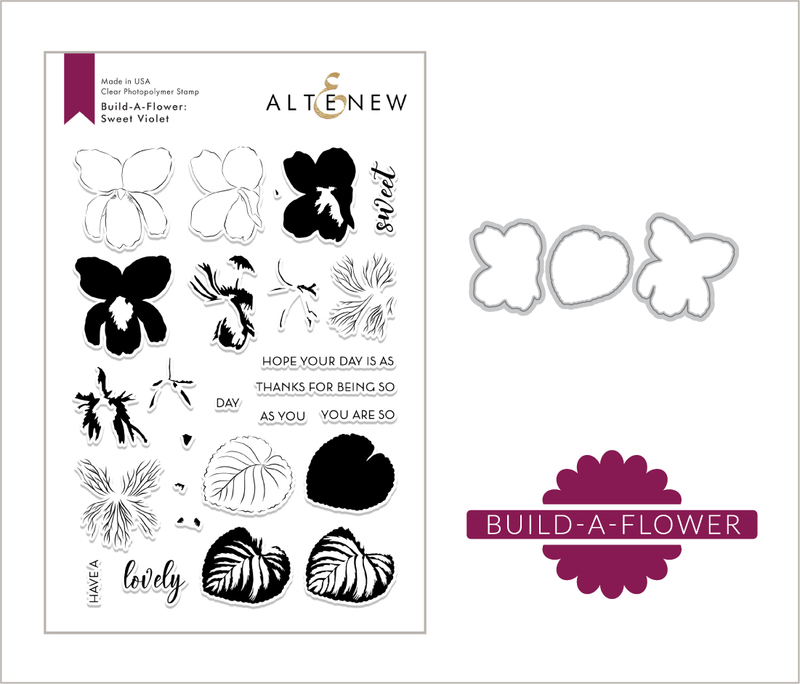 Did you know that Altenew has a Build-A-Flower Monthly Subscription Plan? So lets keep this blog hop going, you should have arrived here from The Hedgehog Hollow, but if not please go back and check out what Alexandra has to share. This Sweet Violet set is very easy to layer and has a very delicate look. 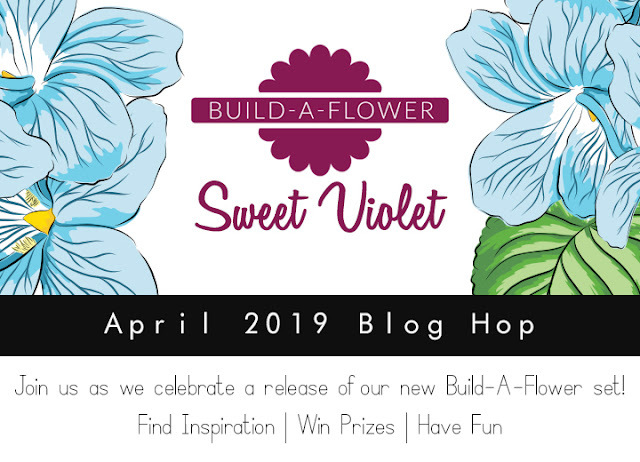 Sweet Violet Build-A-Flower bundle comes with the inks included which is a great way to build your ink collection along with taking the guess work out of the color selection. I have a few examples to share with you today using three color ways. This first example I used the Feathered Leaves Stencil and inked my background using Frayed Leaf Ink. I also inked a small section on the card front using Morning Frost over the Feathered Leaves Stencil. This is a simple shaker card and I wanted a subtle texture to be seen through the acetate window. Deep Blue Seas, Summer Afternoon and Green Fields ink were used for the flowers and leaves. 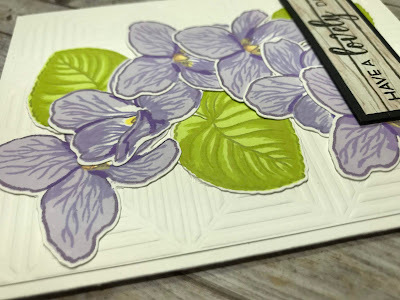 My last card features the violets using Tea Party and Summer Afternoon inks with leaves in Green Meadows ink. I started out with the Rustic Linen background stamp using Morning Frost ink. Altenew Pure White Crisp Powder. 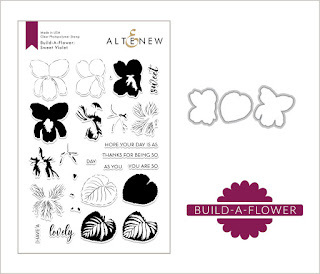 To celebrate this release, Altenew is giving away a $30.00 gift certificate to 6 lucky winners! 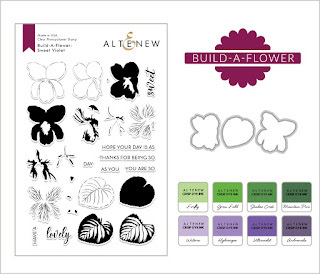 Please leave a comment on the Altenew Card Blog, and/or Altenew Scrapbook Blog for a chance to win. Three winners will be announced on the Card Blog and the other three winners will be announced on the Scrapbook Blog on 4/9/2019. We'll also draw a winner to receive a $15.00 gift certificate from the comments left on each designer's blog on the blog hop list below. 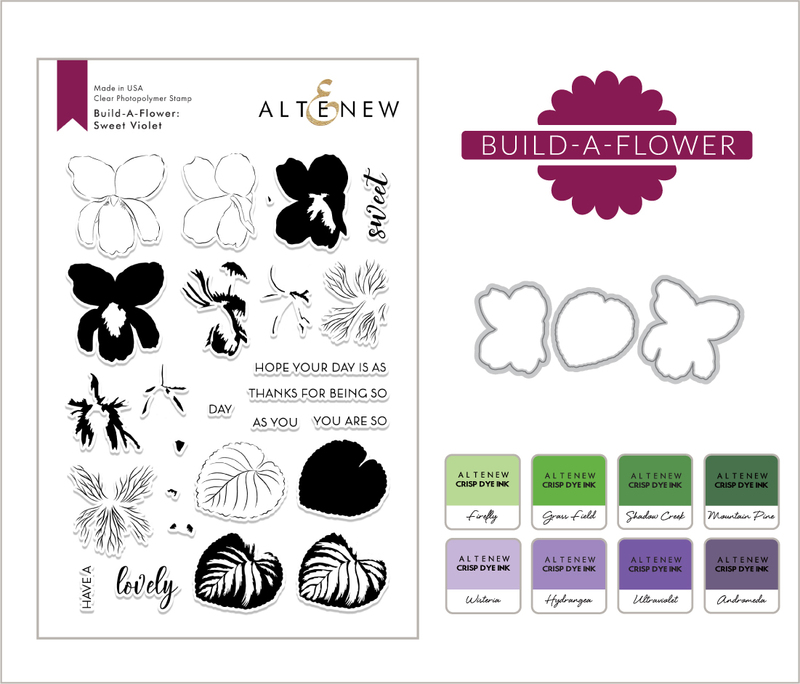 All winners will be announce on the Altenew blogs on 4/9/2019. Below is a complete blog hop list for your convenience. Thanks so much, I love making them. Beautiful cards Nancy!! Love your shaker and you know I love dry embossed backgrounds too! Thanks Amber, two favorite techniques. You are truly very talented crafter! 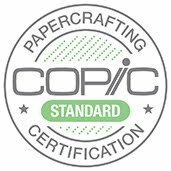 These are such amazing examples of stamping talent which I hope to achieve someday! I love your work! Thanks so much for your comments. I'm sure you do lovely work! The purple violets in your second card stole my heart, so sweet! I really like how the stencil pattern was continued in the shaker part but lighter. 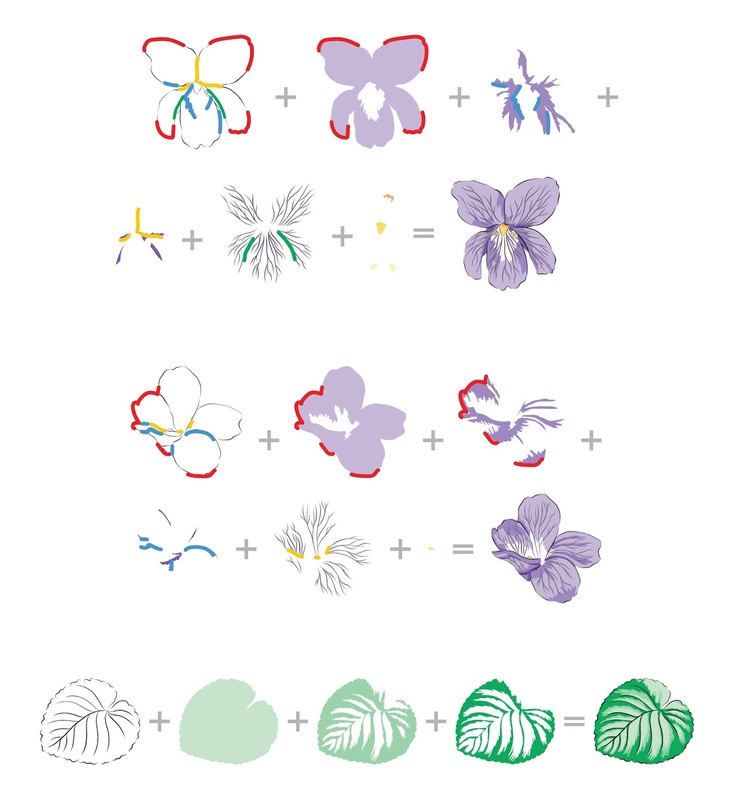 Love the colors you used for the violets. Nany, your cards are fun and beautiul. 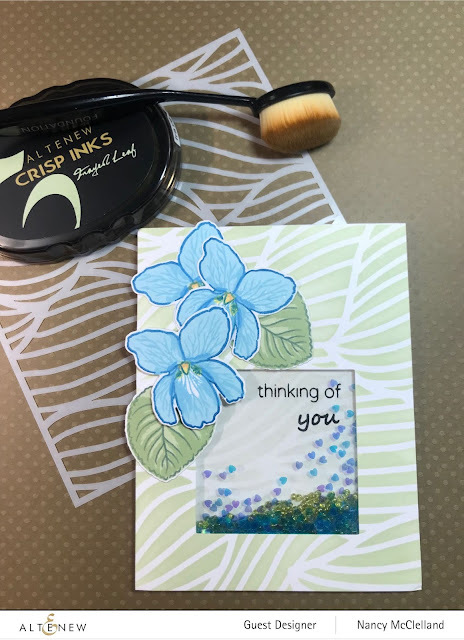 The background wether ink or embossing work beautifully for your cards. Beautiful cards! I think I like the blue violets the best and that background is perfect! Lovely cards!! Your shaker card is fabulous! What a wonderful wealth of beauty. I love all of your cards, especially the shaker. So pretty! Thanks for sharing them. Fabulous set of cards!! Love the various backgrounds. Love your cards. Sometimes I find it difficult to select a background that compliments the flowers without taking the focus away from them. Your backgrounds are a perfect fit. Love how you used the stencil! Beautiful cards.. Thank you. I agree with you about backgrounds, thats why I love cover plate dies and using stencils for that extra texture. All of your cards are so. very. lovely!!! What a stunning set of cards! I love that you showed us all the different colors you can do! Lovely examples! Thanks for the inspiration! Each of your cards are lovely! Violets are one of my favorite flowers! Beautiful cards, love the stencil techniques for the backgrounds to these Sweet Violets, one of my favorite flowers. Beautiful cards with this newest B-A-F set! Violets are one of my favorite flowers, so I am really excited to see this set! Lovely card designs Nancy. This new BAF set is a must have! Thanks for the inspiration. Fabulous cards! 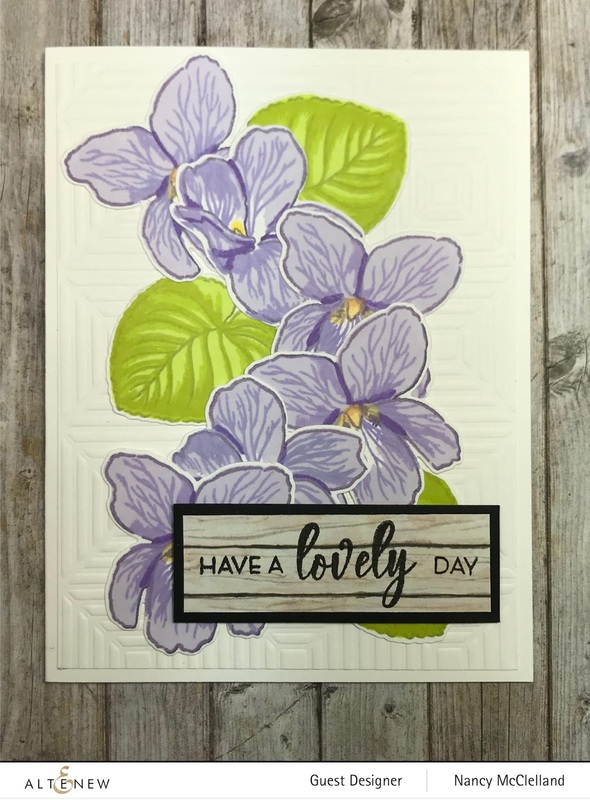 Violets are one of my favorite flowers and I love how you captured their sweet look and created a shaker. This is another beautiful flower! I love the fine veins on the flowers which make them look so realistic. 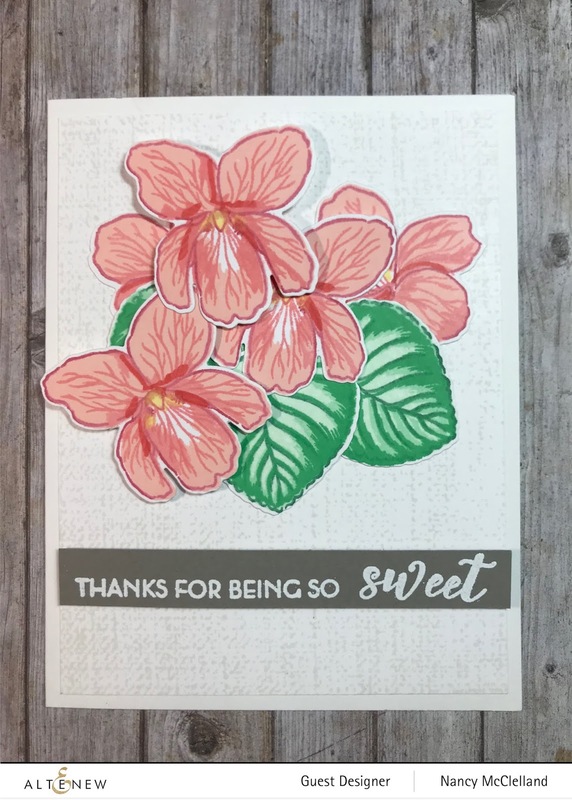 Thanks for the wonderful card inspiration! Three cards, flowers in different colors, different bases, yet every one is gorgeous. The shaker is my fave.....just love the stencil work and the shaker window! Love the variety of colors! Your shaker card is so fun! Thanks for sharing! I love the shaker card. A really fun way to use this set. 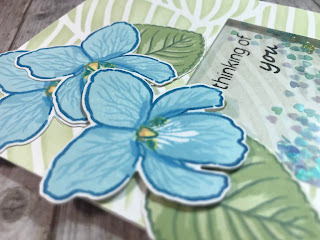 What a lovely post with fun cards!! Love your cards. Thank you for sharing with us! LOVE your PRETTY shaker and SWEET pink card, ADORE your LOVELY purple violets against the embossed background - WOW! You have created so many super pretty cards, Nancy! I love the shaker card! Thanks so much for sharing and for your wonderful inspiration! Beautiful cards! Love all your varied backgrounds. Thanks for the inspiration. Love the cards! They are so gorgeous! My favourite is the shaker card. 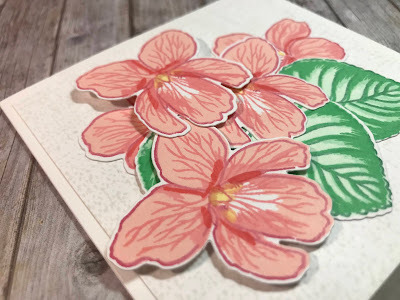 Gorgeous cards - love how you combined the violets with a shaker card, and even though I usually don't love pinks, I love them as your violets - so pretty and they remind me of the ones my mother used to grow. Beautiful cards. I really love your backgrounds. Lovely variety of violet cards. I really like your backgrounds. Shakers are my favorites so I love that one, but they all look fantastic! Beautiful variety of cards. I love all of the lovely colors you used. Very nice! All three cards are gorgeous!